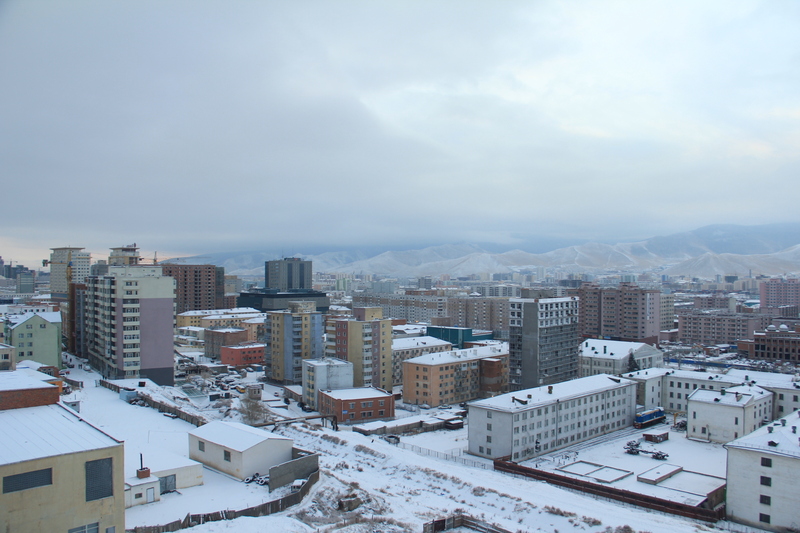 Thursday night marked the beginning of winter here in Ulaanbaatar. It began snowing around 10:00 and that is when the temperature really dropped. That’s not to say it won’t get colder, I’m pretty positive it will, but there was the change from 30-ish degrees F to 15-ish degrees F felt dramatic. I finally cracked and pulled out my extra big winter coat and am even wearing my long underwear today. I was hoping to resist wearing the coat, so that when I really did need it, the added warmth would feel like a relief. But then I realized that cold is cold and there is no use fighting. I don’t think I’m the only one. I’m noticing people are a bit more bundled up now, walking a little faster, and there seem to be fewer people out on the street. Snow and cold aren’t the only indicators that winter has arrived. I popped by the State Department Store (a central landmark in UB) on Friday afternoon to buy a warm hat and scarf and was surprised to see a massive Christmas tree had been erected in front of the building. Inside I heard an unending playlist of American Christmas tunes and saw piles of ornaments for sale. It reminded me of the Christmas craze I saw in Nanjing, China back in 2006. Neither Mongolia nor China have large enough Christian populations for such obvious Christmas spirit to really make sense. I noticed that I felt the same way when I walked into the State Department Store on Friday, that I felt in Nanjing at this time of year: homesick. I’ve only been here for three weeks, and I’m not eager to get back to the United States. But there’s something about the empty acknowledgement of such a nostalgic holiday that really makes me wish I could be home for Christmas. Rather than ignoring the Christmas season, or flat out pretending it doesn’t exist, I am bombarded with reminders. What’s more, it’s a purely commercial portrayal of Christmas, which is the worst! One of my favorite songstresses, Erin McKeown, recently released a new anti-holiday album called “F*ck That”. I think she would appreciate my holiday experience this year. But, the change in seasons does have its advantages. The light dusting of snow changed the look of the city for a few days. For the first time since I’ve arrived, I began to feel at home here. Maybe it’s because of my Minnesotan/Iowan roots, but I find snow to be incredibly comforting. It covers the dusty, brown roads and gives everything a momentary cleansing look. This weekend also marked the end of my introduction to Ulaanbaatar. After spending three weeks with a fantastic host family, I’ve moved in with a handful of young adults (two Australians and one Mongolia) in the city center. But, I managed to get a few opportunities to take some time lapse photography from the balcony before I left. Andrew Little recommended this blog to me. I visited UB a few times before, in 2003 and 2010. Last time I was there I had a surreal/interesting run in with a Mongolian Neo Nazi — just wondering if you have had any experiences/bump-ins with them. They are a weird bunch. Keep up that sunny disposition (and get some colored light bulbs.) Spring is just months away!